The old church of Ylivieska burned down in March 2016 after an arsonist set the 230-year-old structure on fire during on 26.3.2016. The old church was an important landmark for the city and its residents. 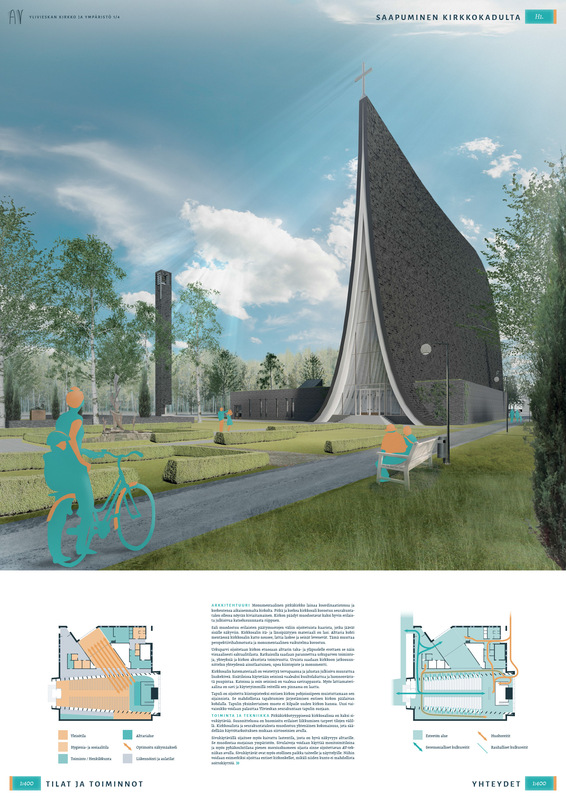 The congregation of Ylivieska held an architectural competition in cooperation with the city of Ylivieska during spring 2017. 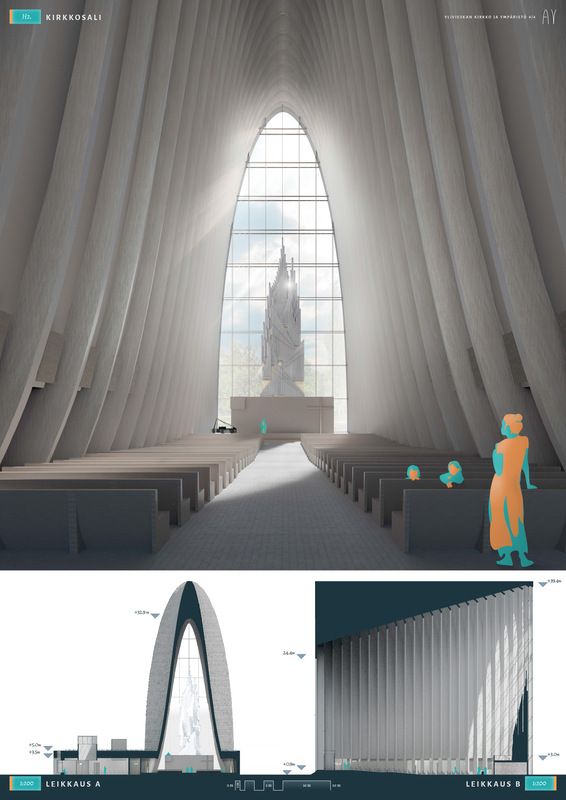 The goal of the competition was to have a winner which can be used as a starting point for the actual design of the new church. Location of the new church was in the park next to the old church. 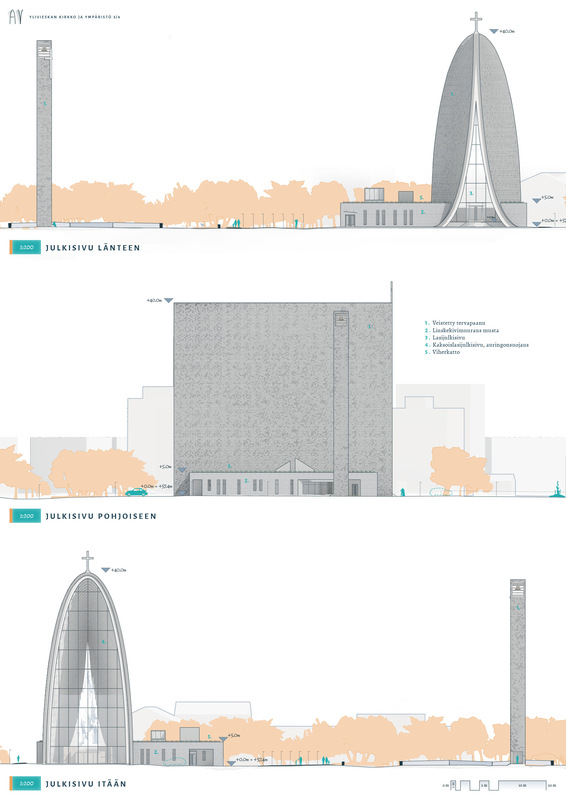 The new church was to be a landmark for the city and include a high profile sacral church and spaces from a soon to be demolished parish hall. 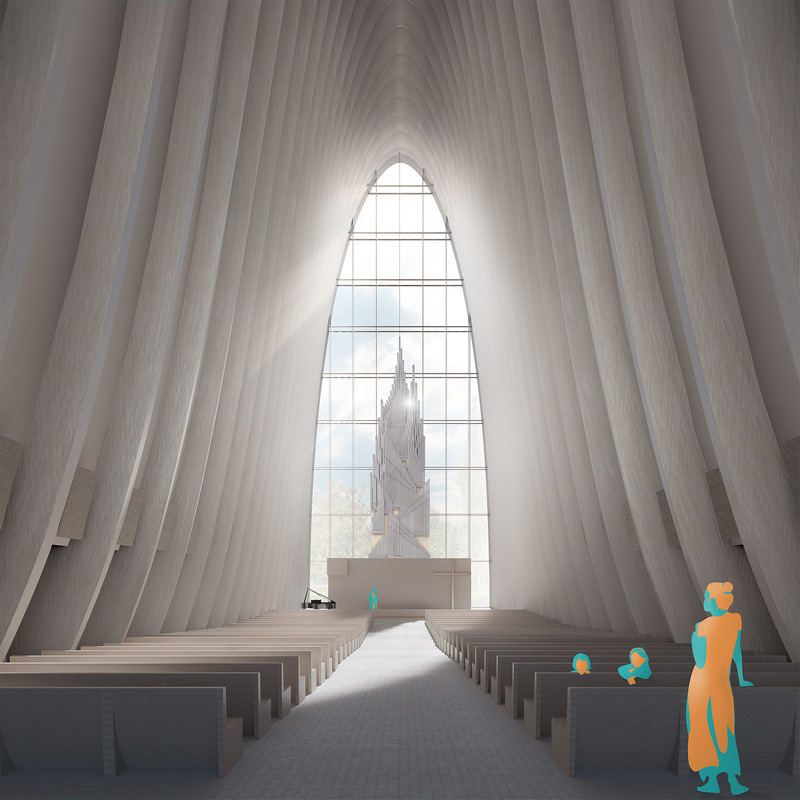 My competition entry called AV combined a high and long majestic main church hall with a low rectangular pedestal that holds the remaining spaces and parish hall. Majestic proportions of the church are worthy of a landmark building. Church hall expands towards the altar and is a beautiful space with the supporting archs framing the view towards the organ located by the eastward glass wall. My entry used natural materials and modern techniques that aim for a healthy and maintainable building for hundreds of years to come. Materials on the high church hall included tarred shingle roof and wooden arch walls. The lower part of the building had a green roof and natural clay walls with hay insulation, stone cladding and clay flooring throughout the church. 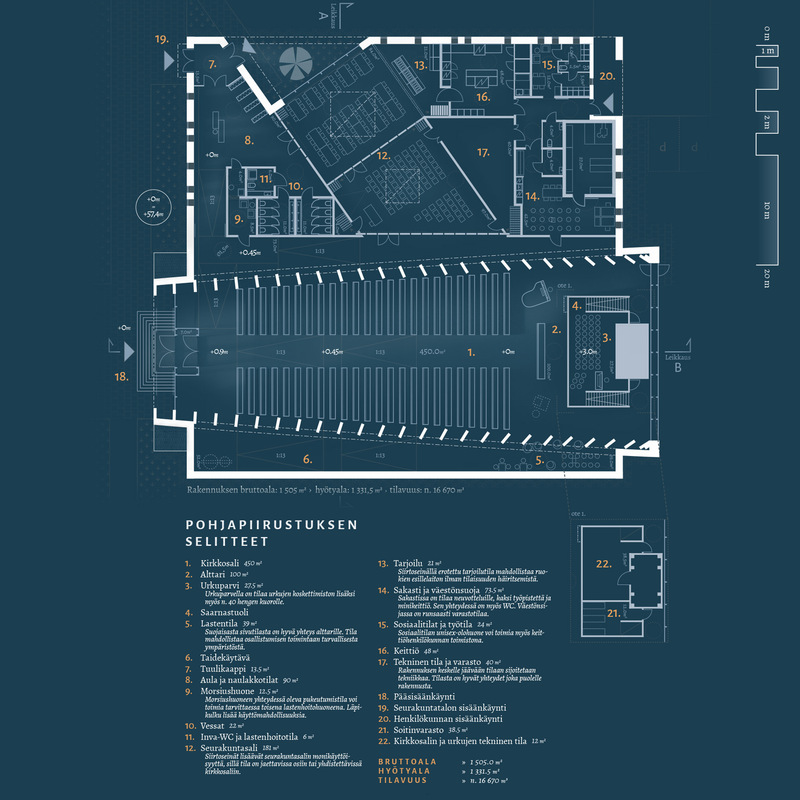 Entry “Trinitas” by K2S architects was elected as a winner by the competition jury. My entry AV was judged to the middle class by the competition jury. 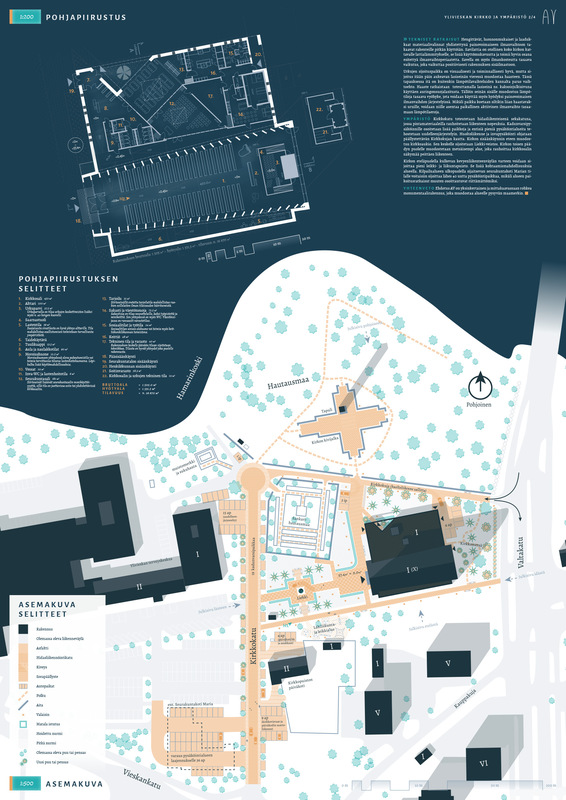 My fellow architect and a friend Jaakko Pöytäniemi assisted me on the proposition especially on the natural materials sections of the entry. Below is the review of AV in Finnish by the competition jury. “Veistoksellinen ehdotus, jossa kirkkosali ja seurakuntasalit on massoittelussa selkeästi erotettu toisistaan ja tapuli sijoitettu vanhan kirkon raunioiden pohjoiseen ristisakaraan. 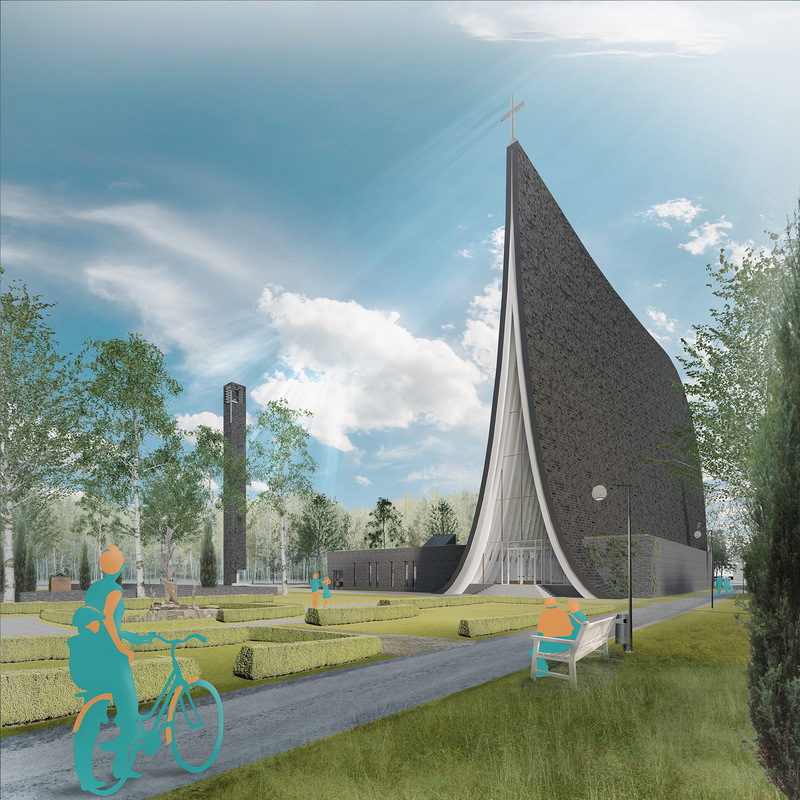 Ehdotuksen katedraalimainen muotokieli toimii hyvin maamerkkinä, mutta on turhankin monumentaalinen Ylivieskan kaupungin mittakaavaan.Kirkkosalin maahan asti ulottuvat katon lappeet on esitetty verhottavaksi tervatuilla paanuilla ja matala suorakaiteen muotoinen sivutilojen massa tummalla liuskekivellä. Toiminnallisesti ratkaisu on kehityskelpoinen. Kirkkosalin alttaria kohti kapenevat, näkyvät kattopalkistot ja alttaria kohti laskeva lattia yhdessä lähes 40 metriin kohoavan katon kanssa tekevät salista dramaattisen. Urut on sijoitettu alttariseinälle koko päädyn kokoisen kuori-ikkunan eteen. Ongelmallisen tilanteen ratkaisuksi on ehdotettu päädyn tekemistä kaksoisjulkisivuna aurinkosuojalasein.